If you wish to experience a Turkish Blue Voyage with a wooden yacht called GULET, you have to options. You can hire a private Gulet (if you are a small group) or you can join to a regular Gulet departure by chartering a cabin. Cabin Charter is for Individuals. There are two popular Cabin Charter itineraries: Marmaris and Bodrum. Here are the brief itineraries. Between May and October we have gulets (6- cabin yacht) departing every Saturday from Bodrum and Marmaris. Departures are guaranteed and we can confirm even 1 passenger on these regular, weekly departures. The trip includes all meals, please find below the Mms-Mms itinerary and the rates. Contact us for further information. Day 01 Late afternoon boarding the yacht. Welcome cocktail, dinner & overnight. Day 02 Departure after breakfast. Lunch in Ekincik, excursion to Kaunos-Dalyan. Overnight in Ekincik. Day 03 Sail to Manastir, free afternoon. Overnight in Manastir. Day 04 Sail to Tersane, free afternoon. Overnight in Tersane. Day 05 Lunch in Fethiye. 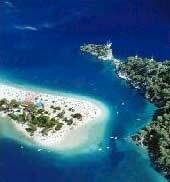 Overnight in a bay near Fethiye. Day 06 Cruise to Oludeniz. Overnight in Gemile. Day 07 Lunch in Kadirga. Free afternoon. Overnight in Kadirga. Day 08 Cruise back to Marmaris. Leave the yacht with wishes to meet again. Day 01 Late afternoon, board the yacht. Welcome cocktail, dinner & overnight. Day 02 Breakfast, cruise to Knidos. Dinner and overnight. Day 03 Breakfast in Mersincik. Lunch in Cati. Afternoon free. Overnight in Cati. Day 04 Sail to Yediadalar. Overnight in English Harbour. Day 05 Sail to Tuzla. Overnight in Ballisu. Day 06 Visit Cleopatra Bay . Lunch and overnight in Karacasogut. Day 07 Lunch in Cokertme. Overnight in Ortaklar. Day 08 Cruise back to Bodrum. Leave the yacht with wishes to meet again. SGL Supplement is 70% Drinks, transfers & personal expenses are EXCLUDED.